Use correct spelling, punctuation, and spacing. After a comma, you should leave ONE space. When you start a new sentence, you should leave TWO spaces (after the end punctuation mark). Read over the comment and edit the comment before submitting. Compliment the writer in a specific way. Write a relevant comment that is related to the post. Your comment should be on topic. Make a connection to something the writer stated in the blog post. Ask a question to keep the conversation going. End with a friendly farewell. Do NOT revealing any personal information about yourself in your comment. 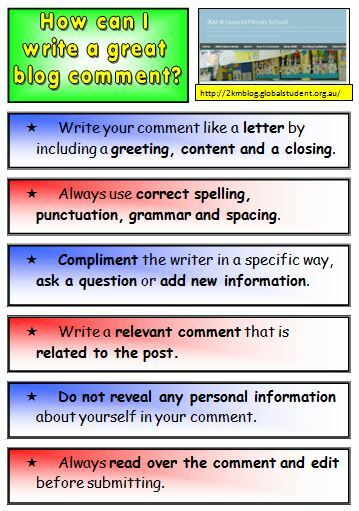 Remember, this blog represents our class, so make sure you always give your best effort to share great writing!